For many of the Nwes team, last weekend was spent training hard with the goal of cycling from Norwich to London in a day firmly set in their minds. In aid of Nelson’s Journey, a local charity supporting bereaved children and young people, 14 enthusiastic cyclists signed up to the challenge of the 125 mile trip in an event organised by Camilla McDermott, Enterprise Support Assistant at Nwes. Monday morning arrived, and those ever generous staff members woke up without that ‘Monday morning feeling’. 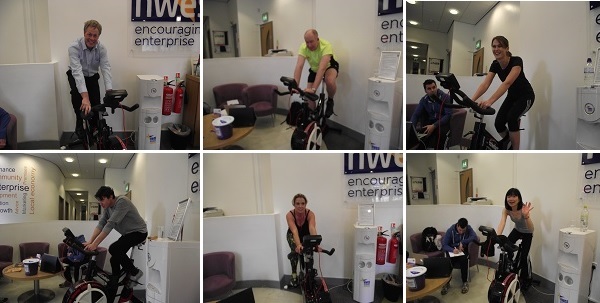 Instead they were fighting fit and raring to go as they set off to meet at the Nwes Norwich Enterprise Centre offices in Guildhall Hill, to commence their marathon cycle ride. There, in reception, they found waiting for them, their cycle for the day. Kindly supplied by Active Norfolk, the exercise training cycle stood upright ready to embrace its first victim. Steve Hitcham from Active Norfolk was on hand to ensure safety and fair play. Camilla took to the seat first and set off towards London. Cycling hard for half an hour she then handed over the driving seat to Emily. In rotation the other 12 team members (Paul, Andrew, Lisa, Lucy, Emily, Victoria, Josh, Mel, Midori, Caszie, Laura and Onaway) took to the saddle for half hour slots and pedalled as fast as they could to ensure reaching their destination before 4.30pm. The 1.30pm slot was filled by Mel, from the accounts team. She carried on courageously despite having forgotten her kit, and was encouraged by the support from the people of Norwich who called in to see what was going on. “One gentleman was slightly confused by the sight of pedal-power in our reception”, said Mel. “He came in to enquire as to whether we were experiencing a power cut? It is no surprise that, in true form, the Nwes team exceeded expectations and managed more than the 125 miles. They actually cycled the distance to take in some of our regional offices on the way at Ipswich, Chelmsford and Harlow, before finishing at a destination in London after a total of 133 miles. If you would like to make a donation you may do so by clicking here. All donations will go to Nelson’s Journey – the Norfolk-based charity supporting bereaved children and young people.